Real estate transactions commonly involve the inclusion of title insurance policies. For the purposes of this blog post, we will be discussing title insurance obtained when a person purchases a house. 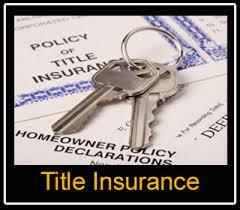 Title insurance is a unique type of insurance, in that the events that are to be covered have already occurred. For instance, an automobile policy covers loss resulting from an accident that could happen after the policy is bound. On the other hand, title insurance covers acts that have already happened but not discovered prior to closing, such as a fraudulent deed in the chain of title. Attorneys who practice real estate law rely upon title insurance companies and their examiners to identify problems with a particular property. Our firm maintains relationships with the major title insurance companies in our region and determines the most appropriate company to use for particular clients. Title companies also play an important role in reviewing closing documents such as Powers of Attorney to confirm that they are valid and in proper form to record. Ideally, title examiners do not miss documents recorded against a property, such as open mortgages that need to be satisfied as of closing. If the title examiner failed to locate a recorded mortgage or if the seller intentionally or inadvertently misled the parties as to the existence of a mortgage, the title insurance company is generally legally obligated to pay the claim for loss suffered by the purchaser (and its lender) because the mortgage lien was not paid and removed as of closing. At the request of the purchaser’s attorney , title companies can provide enhanced coverage in certain situations. For instance, by paying a slightly higher premium at closing, the purchaser can obtain a “market value rider” to the policy. This rider provides that the policy coverage limit will inflate to the future market value of the property, regardless of the amount that the purchaser paid at the closing for the property. Generally, a property sold by a real estate broker to an unaffiliated purchaser reflects market value, making the purchase of the market value rider unnecessary to a purchaser looking for prudent means to reduce closing costs. However, if a property is acquired through foreclosure, an estate or through a seller who was not introduced by a real estate broker, the price paid at closing may be well below market value, making the purchase of the market value rider an intelligent move. “Eagle” policies have been offered by title insurance companies at higher premiums (20% over the standard policy) than traditional title policies. Such policies provide enhanced coverage for issues such as forgery, fraud, forced removal of a structure and losses due to zoning classification. In some cases, such as building violations, the Eagle policy provides coverage, while a traditional title policy provides no such coverage. Our attorneys have the experience to determine the best policy and rider suitable to the needs of our clients. Title insurance is a vital component of a real estate property purchase transaction. Our attorneys endeavor to select the title insurance company best suited to our client’s requirements, so that our client will be protected in the event of a claim.